Elisa Massimino, President and CEO of Human Rights First: President Trump’s executive order on immigration and refugees threatens our most cherished ideals as Americans. It is cruel, dangerous, and wrong. We are fighting back. VOLUNTEER TO HELP A REFUGEE. Lawyers, contact us. DONATE MONEY. We are a nonprofit and your financial support makes our life-saving work possible. CONTACT YOUR REPRESENTATIVES to tell them you oppose policies that endanger refugees and harm our immigrant friends and neighbors. DONATE RESOURCES. Help a refugee to survive in the United States by donating items or funds to our client emergency fund. Use the form below to contact us about donating your extra coat, baby clothing, diapers or other similar items to refugees in need. USE YOUR SECOND LANGUAGE. Use the form below to contact us to volunteer as an interpreter for meetings with potential asylum clients or to help with the translation of documents. RAISE YOUR VOICE. 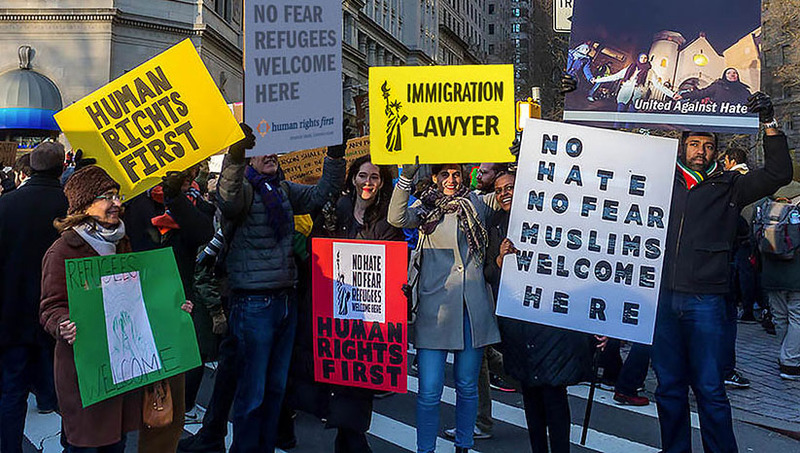 Join peaceful protests to call for change, share your positive refugee stories, and speak up to oppose harsh immigration measures that harm refugees and immigrants. USE YOUR PROFESSIONAL SKILLS. If you are a doctor or mental health professional, contact Physicians for Human Rights or HealthRight International for information about documenting the effects of torture or otherwise helping to support pending asylum cases. HOUSE A REFUGEE. Airbnb offers free accommodations to those affected by the recent U.S. travel ban. Learn more about listing your space or supporting the effort. SIGN UP. You may also sign up below to be added to our pro bono listserv, where you will receive updates on opportunities to help and news about the current situation and what we’re doing to combat it. PUSHING CONGRESS. We’re pushing Congress to rescind President Trump’s xenophobic, unconstitutional executive order in order to permit entry to refugees and asylum seekers from all countries. SEEKING CLARITY. We’re seeking clarity on issues that are still unclear, such as how the executive order affects refugees and asylum seekers traveling abroad on refugee travel documents, and how the executive order will affect those seeking asylum from the seven banned countries. FIGHTING FOR REFUGEES. We’re working to ensure that refugees arriving as part of the refugee resettlement program in the next few days are allowed to enter the United States. PROTECTING OUR CLIENTS. We’re taking steps to protect our clients from deportation and removal, as well as from potential future threats to their ability to seek safe haven in the United States. JOINING UP. We’re partnering with sister organizations to circulate resources, provide advice, and create strategies for combating this order. KEEPING YOU IN THE LOOP. We’re monitoring the situation and keeping our attorneys informed and up-to-date on the situation as it evolves. Refugees need your help now more than ever. Sign up here to be added to our pro bono listserv, where you will receive updates on opportunities to help and news about the current situation and what we’re doing to combat it. If you’d like to volunteer translating services or contribute to the client emergency fund, please indicate so in the comments section. Thank you for standing with Human Rights First to tell the world that refugees are welcome here.